All vehicles on a network must have running gear that is compatible with the track gauge, and in the earliest days of railways the selection of a proposed railway's gauge was a key issue. As the dominant parameter determining interoperability, it is still frequently used as a descriptor of a route or network. There is a distinction between the nominal gauge and actual gauge at some locality, due to divergence of track components from the nominal. Railway engineers use a device, like a caliper, to measure the actual gauge, and this device is also referred to as a track gauge. 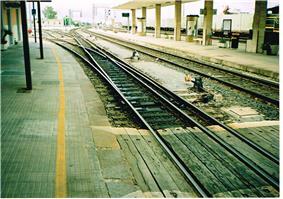 The nominal track gauge is the distance between the inner faces of the rails. In current practice it is specified at a certain distance below the rail head as the inner faces of the rail head (the gauge faces) are not necessarily vertical. Track is defined in old Imperial units or in universally accepted metric units or SI units. Imperial units were established in United Kingdom by The Weights and Measures of Act of 1824. The United States customary units for length did not agree with the Imperial system until 1959, when one International yard was defined as 0.9144 meters, i.e. 1 foot as 0.3048 meter and 1 inch as 25.4 mm. In the earliest days of railways, single wagons were manhandled on timber rails, almost always in connection with mineral extraction, within a mine or quarry leading from it. Guidance was not at first provided except by human muscle power, but later a number of methods of guiding the wagons were employed. The rails had to be at a spacing that suited the wagon wheels. The timber rails wore rapidly and later flat cast-iron plates were provided to limit the wear. In some localities, the plates were made L-shaped, the upstand of the L providing the guidance; this is generally referred to as a "plateway". 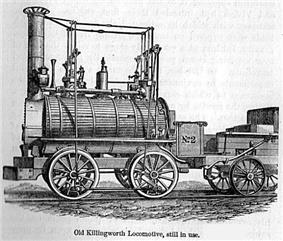 Locomotives were being developed in the first decades of the nineteenth century; they took various forms, but Stockton and Darlington Railway was opened in 1825, it used his locomotives, with the same gauge as the Killingworth line, 4 ft 8 in (1,422 mm). The Stockton and Darlington line was immensely successful, and when the Liverpool and Manchester Railway, the first intercity line, was promoted (it opened in 1830), it used the same gauge. It was also hugely successful, and the gauge (now eased to 4 ft 8 1⁄2 in (1,435 mm)), became the automatic choice: "standard gauge". The Liverpool and Manchester was quickly followed by other trunk railways, with the Grand Junction Railway and the London and Birmingham Railway forming a huge critical mass of standard gauge. When Bristol promoters planned a line from London, they employed the innovative engineer Isambard Kingdom Brunel. He decided on a wider gauge, to give greater stability, and the Great Western Railway adopted a gauge of 7 ft (2,134 mm), later eased to 7 ft 1⁄4 in (2,140 mm). This became known as broad gauge. The GWR was successful and became greatly extended, directly and through friendly associated companies, widening the scope of broad gauge. At the same time, other parts of Britain built railways to standard gauge, and British technology was exported to European countries and parts of North America, also using standard gauge. Britain polarised into areas that had broad gauge lines or standard gauge lines. In this context, standard gauge was referred to as narrow gauge to indicate the contrast. Some smaller concerns selected other non-standard gauges: the Eastern Counties Railway adopted 5 ft (1,524 mm). Most of them converted to standard gauge at an early date, but the GWR's broad gauge continued to grow. 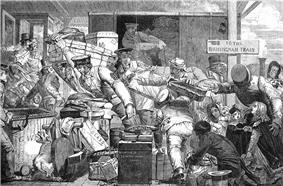 As passengers and freight between the gauges became increasingly important, the difficulty of moving from one gauge to the other — the break of gauge – became more prominent and more objectionable. Parliament intervened with an Act that forbade the construction of broad gauge lines unconnected with the broad gauge network, and the broad gauge network was eventually converted—a process called gauge conversion—to standard, progressively until 1892. The same Act mandated the gauge of 5 ft 3 in (1,600 mm) for use in Ireland. As railways were built in other countries, the gauge selected was pragmatic; the track would have to fit the rolling stock. If locomotives were imported from elsewhere, especially in the early days, the track would be built to fit them. In some cases standard gauge was adopted, but many countries or companies chose a different gauge as their national gauge, either by governmental policy, or as a matter of individual choice. Government officials in Spain and Russia were concerned that the rail lines they were planning could be used by an invader, and purposely chose gauges that were different from their neighbors. Narrow gauges were widely used in mountainous regions as construction costs tended to be lower and they provided for tighter turns that were often required. In some countries, multiple gauges were chosen by long-distance networks, particularly in India and Australia. In the British area of influence in southern Africa, 3 ft 6 in (1,067 mm) was widely adopted. The terms structure gauge and loading gauge have little connection with track gauge. They are both widely used, but imprecise, terms. Structure gauge describes the cross-section envelope into which new or altered structures (bridges, lineside equipment etc.) must not encroach. Loading gauge is the corresponding cross-sectional profile within which rail vehicles and their loads must be contained. If an exceptional load or a new type of vehicle is being assessed to run, it must conform to the route's loading gauge. Historically, a space between the two profiles was required to allow for dynamic effects, extreme wear and surveying tolerances, but in current practice, all tolerances are incorporated into the vehicle operating profile and no other allowance is necessary. Nowadays, there are other parameters that must be assessed for interoperability, including electro-magnetic compatibility, compliance with control system parameters, axle load and loading envelope. In Australia, 3 ft 6 in (1,067 mm) and 3 ft (914 mm) gauge railways are classified as medium gauge in order to make a distinction with standard gauge and the narrow gauges such as the widely used 2 ft (610 mm) gauge sugar cane railways. In India and Bangladesh, broad gauge (BG) is the classification for the dominant Indian gauge, Metre or medium  (MG) for 1,000 mm (3 ft 3 3⁄8 in) gauge railways and narrow gauge (NG) for 2 ft 6 in (762 mm) and 2 ft (610 mm) railways. In 1847, the 1,600 mm (5 ft 3 in) Irish gauge was considered a medium gauge compared to Brunel's broad gauge and the 1,435 mm (4 ft 8 1⁄2 in) narrow gauge, nowadays being standard gauge. In North America medium gauge was 5 ft 6 in (1,676 mm) track gauge, also called "Canada Gauge". Sometimes railways built on gauges between 1,000 mm (3 ft 3 3⁄8 in) and 4 ft 8 1⁄2 in (1,435 mm) are referred to as "medium-gauge" railways. During the period known as "the Battle of the Gauges", Stephenson's standard gauge was commonly known as "narrow gauge", while Brunel's railway was termed "broad gauge". 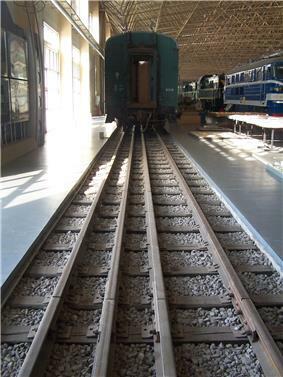 Industrial railways are often narrow gauge. Sugar cane and banana plantations are often served by narrow gauges such as 2 ft (610 mm), as there is little through traffic to other systems. 1,000 mm (3 ft 3 3⁄8 in) metre gauge (SE Asia, 17,000 km (11,000 mi) in India, East Africa, South America and Central Europe). 762 mm (2 ft 6 in) (formerly in Sri Lanka Kelani Valley Line and Udapussellawa lines). On the Transmongolian Railway, Russia and Mongolia use 1,520 mm (4 ft 11 27⁄32 in) Russian gauge while China uses standard gauge. At the border, each carriage is lifted and its bogies are changed. The operation can take several hours for a whole train of many carriages. Trains of different gauges sharing the same track can save considerable expense compared to using separate tracks for each gauge, but introduces complexities in track maintenance and signalling, and may require speed restrictions for some trains. If the difference between the two gauges is large enough, for example between 1,435 mm (4 ft 8 1⁄2 in) and 3 ft 6 in (1,067 mm), three-rail dual-gauge is possible, but if not, for example between 3 ft 6 in (1,067 mm) and 1,000 mm (3 ft 3 3⁄8 in) metre gauge, four-rail triple-gauge is used. Dual-gauge rail lines are used in Switzerland, Australia, Argentina, Brazil, Japan, North Korea, Spain, Tunisia and Vietnam. On the GWR, there was an extended period between political intervention in 1846 that prevented major expansion of its broad gauge[note 1] and the final gauge conversion to standard gauge in 1892. Infrastructure owners specify permitted variances from the nominal gauge, and the required interventions when non-compliant gauge is detected. For example, the Federal Railroad Administration in the USA specifies that the actual gauge of track that is rated for a maximum of 60 mph (96.6 km/h) must be between 4 ft 8 in (1,420 mm) and 4 ft 9 1⁄2 in (1,461 mm). Sixty per cent of the world's railways use 4 ft 8 1⁄2 in (1,435 mm) standard gauge. 1,435 mm (4 ft 8 1⁄2 in) Standard gauge 720,000 450,000 Europe, Argentina, United States, Canada, China, Korea (South), Korea (North), Australia, India (Only used in MRTS/Metro), Indonesia, (only at Aceh), Middle East, North Africa, Mexico, Cuba, Panama, Thailand (used in BTS Skytrain, MRT (Bangkok) and Airport Rail Link (Bangkok)/Metro), Venezuela, Peru, Uruguay and the Philippines. Also privates companies lines & JR high-speed lines in Japan. High-speed lines in Taiwan and Spain. 1,668 mm (5 ft 5 21⁄32 in) Iberian gauge 15,394 9,565 Portugal, Spain. Sometimes referred to as Iberian gauge. In Spain the Administrador de Infraestructuras Ferroviarias (ADIF) managed 11,683 km of this gauge and 22 km of mixed gauge at end of 2010. The Portuguese network is actually at 1674mm[note 2] The Portuguese Rede Ferroviária Nacional (REFER) managed 2,650 km of this gauge of this track at the same date. (approx. 6.67% of the world's railways), BART in the United States San Francisco Bay Area. Further convergence of rail gauge use seems likely, as countries seek to build inter-operable networks, and international organisations seek to build macro-regional and continental networks. National projects include Australian and Indian efforts to create a uniform gauge. The European Union has set out to develop inter-operable freight and passenger rail networks across its area, and is seeking to standardise gauge, signalling and electrical power systems. Gauge conversion of existing lines is extremely expensive and it is likely that only primary trunk routes will be converted, with new strategic lines being built to standard gauge. The interoperability problem within the EU is not only rail gauge but also loading gauge, especially for the United Kingdom, which has standard rail gauge but generally one of the smallest loading gauges in the world. Lines for iron ore to Kribi in Cameroon are likely to be 1,435 mm (4 ft 8 1⁄2 in) with a likely connection to the same port from the 1,000 mm (3 ft 3 3⁄8 in) metre gauge Cameroon system. This line owned by Sundance Resources may be shared with Legend Mining. A proposal was aired in October 2004    to build a high-speed electrified line to connect Kenya with southern Sudan. Kenya and Uganda use 1,000 mm (3 ft 3 3⁄8 in) metre gauge, while Sudan uses 3 ft 6 in (1,067 mm) gauge. Standard gauge was proposed for the project. 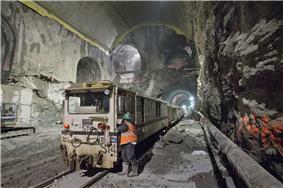 Narrow gauge work train in an East Side Access cavern that will eventually house a standard gauge station for the Long Island Railroad. ^ According to Alvarez both Spanish and Portuguese national networks were originally built to 1674mm, but the Spanish network "has been converted" to 1668mm. ^ "Beyond Thunderdome: Iron Curtain 2k6". Retrieved 2007-10-10. ^ "Track Safety Standards Compliance Manual Chapter 5 Track Safety Standards Classes 1 through 5" (PDF). Federal Railroad Administration. Retrieved 26 February 2010. 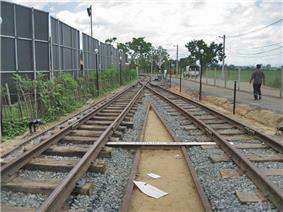 ^ "Venezuela, Argentina begin construction of railway linking their capitals". China Daily. Xinhua. 2008-08-21. Retrieved 2008-08-21.